6. You will receive an email message (sample below) from WebMaster@dmimtg.com notifying you your request to go paperless is complete. 7. Once you have successfully signed up to go paperless, you can view your e-Statements under the Mortgage Details page by clicking on e-Statement in the left menu. 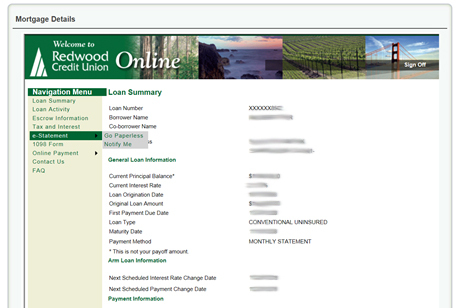 Note: As you hover over and select the e-Statement link in the navigation, disregard the flyout menu to the right. If you are on a tablet or mobile device you may need to click the link twice. How do I make a payment on my first mortgage? Why did the format of my first mortgage statement change?